Cosequin® ASU for Horses is professional strength, dual synergistic formula to help horses maintain healthy joints and cartilage. Cosequin ASU goes beyond the original Cosequin formula with the addition of avocado/soybean unsaponifiables (ASU), a potent ingredient to protect cartilage. 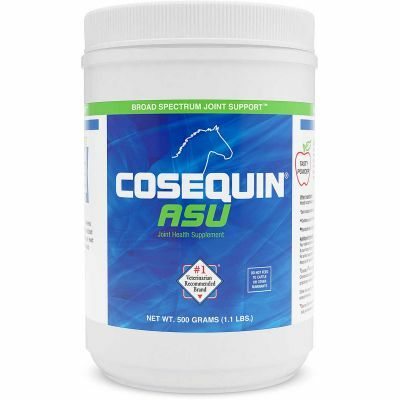 Cosequin ASU contains the exclusive, patented formula of TRH122®* chondroitin sulfate, FCHG49®* glucosamine and also manganese ascorbate, plus MSM. The superior quality and specific combination of ASU with glucosamine and chondroitin has been shown to work better than glucosamine/chondroitin supplements alone. The superior quality and specific combination of ASU with glucosamine and chondroitin has been shown to be superior to glucosamine/chondroitin supplements alone. Each 16.1 gram scoop contains 7200 mg glucosamine hydrochloride, 1200 mg chondroitin sulfate, 50 mg manganese, 305 mg ascorbic acid, 5000 mg MSM and 1050 mg ASU.